The International Cinema Technology Association is the trade organization of Cinema equipment manufacturers and cinema dealers. Each year, the dealers vote on which manufacturer is doing the best job in meeting their needs. QSC is up against other brands. 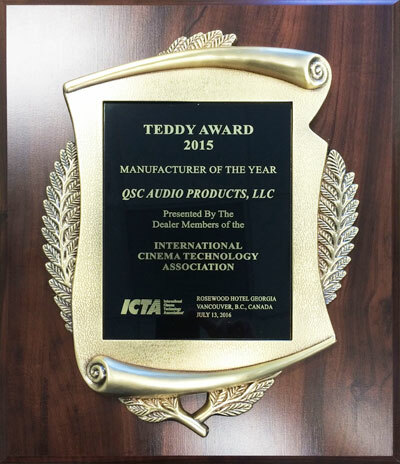 The award is called the Teddy Award "The Teddy Award is presented annually at the ICTA Convention by the active Dealer membership of the ICTA to the ICTA Manufacturer who most closely exemplifies the progressive principals of product development, and provides the dealers with service and up-to-date technical and sales information, while supporting the status of his product without qualification." QSC won the award last year and in a rare occurrence, we won again for the second time in a row at the Annual ICTA Convention last week. We are glad to inform you that "QSC" has been nominated for for three individual 2018 Technical Excellence & Creativity (TEC) Awards for outstanding technical achievement in product design, innovation and production. Please find below the link for detail information.